Here is a great centerpiece idea for your wedding reception tables. Float an assortment of bright, vibrant flowers in a clear spherical bowls. You can use a few different sized bowls, as in the picture above, or stick to a uniform size so that all of the tables match. 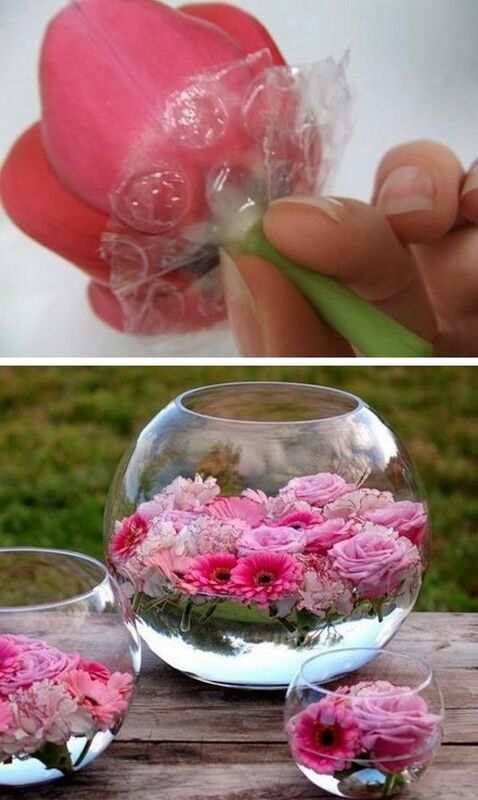 To make each flower float, place a small disk of bubble wrap around the base of the flower head. Seal it into place with water-proof glue or a little piece of clear packing tape. Place a few among your dessert bar or buffet, or on the table that holds your guest book and gift card box. You could even put a few by the altar. Do you like this centerpiece idea? Leave a comment below!